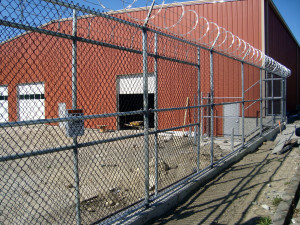 Deter Vandalism in Vancouver with Security Fencing & Gates | | QS Fencing Ltd.
As reported in the CBC last week, vandals have been “targeting parked container trailers in Metro Vancouver.” Vandalism in the Greater Vancouver Area can be quite serious and we see both random damages and targeted vandalism. Unfortunately, it’s hard to predict who will be hit or why, but we can easily see that the cost of vandalism can be a major finical setback or even bankrupt a small company. This is where QS Fencing Ltd.’s line of commercial security fencing can end up saving you money and offer finical security to your business. By installing commercial security fencing you can lower the risk of vandalism by a significant amount. Fencing and gates offer a clear visual deterrent and with QS Fencing Ltd. you can install a security gate and commercial security fencing that’s designed to physically stop among the most determined efforts to access your property. QS Fencing Ltd. has designs specifically made for use in residential spaces as well as designs and installations made especially for commercial security fencing. Contact QS Fencing Ltd. for pricing and estimates for security fencing, as a family run fencing business in Vancouver ourselves, we understand the stakes and will help secure your property and your investments for years to come.